After 13 miles it was almost too much. But they heard it before they saw it. Beyond that final hill was the finish line – and the chorus of cheering people brought it closer. And with the backing of thousands of enthusiastic onlookers, battered legs, sore feet and mental fatigue simply evaporated. And many flew. Whatever the individual reason, it was an achievement the crowd wanted a part of. And the experience got me thinking about the importance of networking for micro business owners. If you’ve stayed intentionally small, the chances are you can’t achieve your business goals in isolation. That’s because other people make your business a success. Outsourcing helps you gain a missing skill or overcome lack of time. Second opinions from trusted confidents spur you on with an idea. And socialising with other people who get what it’s like to run a micro enterprise is invaluable motivation. One of the secrets to a wildly successful micro business is wild supporters. And relationship building is the key to achieving that. It’s simple. People buy from people. And networking allows others to know, like and trust you. What’s more, as a micro business owner, your impact will explode when you become a key person of influence in your niche. Networking with the right people can help you achieve that too. Build a strong informal team of likeminded people. 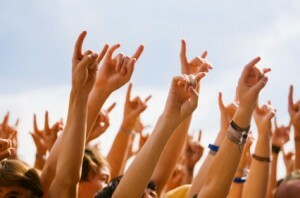 Stir up “word of mouth” support to grow your business and spread your message. Twitter, Facebook and LinkedIn are fantastic free platforms you can use to grow your authority and extend your network. And offline, face-to-face networking enables you to build deeper relationships with people you’ll meet on a regular basis. Be warned. If you want quick gratification, networking will not work. I’ve noticed a lot of people get disappointed when they don’t get immediate results and claim social media and networking groups are a waste of time. The thing is no one likes to be sold to. Meaning if you approach networking with the mindset of sell, sell, sell – you’ll simply turn people off. By all means network with the intention of growing your business. But instead of trying to sniff out the next sale, explore the value in each interaction.That person may refer you, become a friend, offer support – and they may even become a customer. To build that team of wild supporters you must appreciate networking needs time and nurturing. Remember that know, like and trust formula? You can’t expect to jump directly to the trust stage – you need to build up to that. Instead show up with the intention of helping those in your circle. Be alert for how you can add value, be helpful, be useful and be nice! I love Bob Burg’s take on this. His book, the Go-Giver, is a fantastic read. There are lots of different networking groups, and the one that’s worked best for me is 4Networking. Here are the features I especially like. A joined up national network: Is fantastic if your customer base is not local. You can connect with other business owners through the online forum and you have the option of attending groups across the country. Structured: The meets take the same format at ever group. When visiting you just slot in because you know exactly what’s going to happen. Three 121 appointments: 30 minutes of the 2-hour session is spent in 121s with people you choose to speak with. You know where you stand, you get to have valuable conversations, and you don’t have to worry about breaking away – the structure tells you when it’s time to do so. Learn: The 4Sight slot gives you an insight into a new business field, but also lets you practice your own business presentation and pitching skills – invaluable experience. 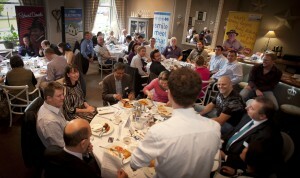 4N works so well for me I’m going to be group leader for a new Plymouth evening group. Our first meeting is on Wednesday 27th June 2012 – 6:30-8:30pm at the Future Inn. Please come! To view the format, discover more details or to book, simply click here. At the beginning I promised you a link between networking and the Plymouth half marathon. You’ve probably already worked it out – but here’s my take on it anyway. In order to be successful in business you’ve got to have people rooting for you – even complete strangers. That’s because being a micro business owner isn’t just about the work and the output. Your business quickly gets wrapped up in your personality and becomes part of your identity. Good networking will enable you to build that team around you who cheer you on, even when times get tough. Well said! I totally agree re importance of know/like/trust. And its the same for communicating with the media – get to know your local journalists so that they ‘know, like, trust’ you and they will help you build your business!